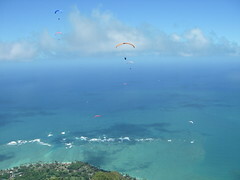 Sunday was the 2006 Kahana Flyathlon and Tree Decorating Contest. 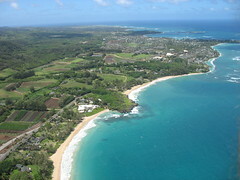 It was a great day of ups and downs, and possibly our best fly-in to date, rivalling the original Makapuu event. 24 pilots flew, and almost as many friends and family members helped us celebrate the day. The day started out grim and dreary, the windward side was socked in with misty rain and the wind sensors were averaging high teens with 20+ mph gusts, hardly a day to get everyone flying. I had already called it a go the day before, so there was no stopping the gathering. At 10am everyone was arriving and it was looking like a better day for a bbq. After a little stalling, everyone started heading up to launch to give the slightly improving conditions a go. Ken Berry and Jetflap Jeff took the role of wind dummies and launched into fairly strong conditions. Ray and I grabbed our little wings and headed up to have some fun. As more pilots launched conditions seemed to be rapidly improving, wind slackening and the sun shining. Pilots started climbing higher and flying deeper into the peak. Jetflap Jeff recorded 2830' for the highest altitude of the day right about that time. Worth $20. As some 15 pilots filled the sky, Alex proposed that we run the downranger to Pounders after all, and about 10 pilots took up the challenge. At this point I would like to indulge myself and report the race from my perspective. Since I had committed myself to flying my little acro glider I felt somewhat handicapped for some racing. Climbing in that little glider was noticably slower than the other gliders so I figured I needed to tank up on altitude before the start to have any chance at getting there. The race started and Gavin from Australia is racing away on lots of speedbar, I step in the loop and apply a little speed to keep up in the smooth conditions. We both look for some good lift at the first ridge and quickly commit to the second big ridge by Alex's house with the iron cross on it. I turn into some lift and fairly strong winds and Gavin and (fast arriving) Alex in the Magic4 start climbing above me. They settle down from the drag race over and climb higher and deeper toward Sacred Falls. I manage about 300' altitude gain and take a chance that at 1200' and downwind I can reach Pounders. I turn and burn before the others have a chance to react and arrive at Pounders Beach with a couple hundred feet to spare and land in the windy conditions. Gavin drops in next with Alex on top of him for third. Sandy drops back a little far and lands a quarter mile short on the other side of the point, great job. Thomas lands next for fourth place, Bob lands next and finally Wolfgang from Germany, who rather than quickly dropping his glider in the stong wind, puts on an impromptu Mike Kungish kiting display, excellent. 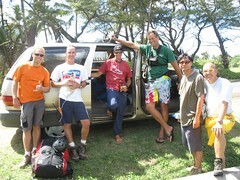 Nick arrives in my van for the retrieve and we pick-up Sandy, Johan and Peter (from Germany) on the road back to Kahana. We arrive back at Kahana to even more pilots coming and going, Treeslayer has found his second tree of the day unfortunately, and we fuel up at base camp on the far side of the venturi. It amazes me that we have never used this venue before since you can easily watch the flying from the shade of the trees. We have the spot and the bomb drop setup nearby for all the spectators to enjoy. I would like to thank all the friends and families that hung out, cooked, swam and laughed with us to make it more special. The number of visiting pilots was amazing considering that they knew nothing about the days plans. The spot landing was too easy or our pilots too good because Frank straddled the bucket, Jetflap stood on the bucket as did Greg the Treeslayer. The bomb drop proved more difficult with Frank holding the lead for most of the day until Bob risked life and "limb" to put one down right on top and an inch closer than Frank's sandbag for the win. But the glory was short lived as he "greeted" some foliage on landing. We had all sorts of pilots, old and new, come out and show us their stuff, tandem flights were flown, a little acro went down. Alex, the master of memory, (and apparently lists) compiled a list of who was there, we apologize if we missed anyone. 24 pilots flew in one day. I think I heard there were 15 in the air at one point. Don, Reaper, and Mad Dog were all out of the country. And a few other familiar faces couldn't make it out. The festivities lasted long after dark and the day magically went from ugly to perfect. I want to thank everyone for making it the day that it was. Next time. 1) Dave Taratko aka "Fireman"
Great article Dave. Thanks for making the event happen on such short notice. I added some photos to the body of the story for you, and listed the albums at the end. If anyone else has any photos or stories to contribute let us know.